Thanksgiving is upon us, and we may be looking forward to all of the great food associated with that day. While we enjoy-and sometimes overindulge in-the turkey and all of its trimmings, some of these foods can be harmful to our pets. Maintain your pet’s regular diet. Treats of turkey, ham, gravy, cookies, and other goodies can lead to gastrointestinal upsets like diarrhea and vomiting. Dispose of all bones carefully so that pets cannot get to them. Poultry bones are particularly dangerous, as they can splinter and cut the intestines or get lodged in your pet’s esophagus. Guilty pleasures for humans, like chocolate and alcohol, can be toxic to pets. Keep chocolate, nuts, and alcoholic beverages out-of-reach from your pets, as they can cause vomiting, diarrhea, or a condition called pancreatitis, which can be deadly. Grapes and raisins can be toxic to pets, as well. 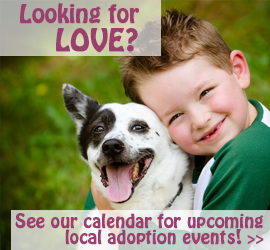 Be sure that everyone in your family knows and understands what your pets can and cannot consume. If you wish to celebrate Thanksgiving with your pet, consider an appropriate Thanksgiving dinner by Merrick like, “Turducken,” “Grammy’s Pot Pie,” or “Thanksgiving Day Dinner.” Find these and other delicious treats at Braxton’s Animal Works. 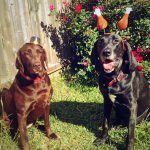 Want to make something homemade for your pet, check out these special Thanksgiving recipes for dogs and cats by clicking here. As with any potential emergency, immediate attention from your veterinarian is imperative. Penn Vet’s Emergency Service is open 24 hours a day, seven days a week, 365 days a year. The Emergency Service is staffed by an integrated team of board-certified specialists who attend to each patient’s emergency and critical care needs. 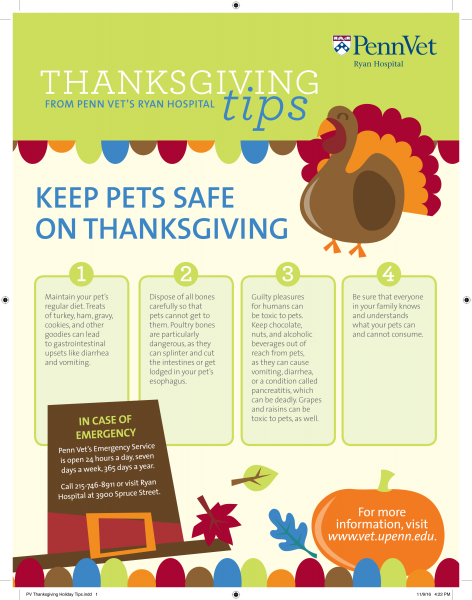 Call 215-746-8911 or visit Penn Vet’s Ryan Hospital at 3900 Spruce Street.